Samsung most recent flagship smartphones, the Galaxy S9 and S9+ are on sale at Samsung Store. If you're looking to buy a new Samsung top-tier handset, this is the best place to shop. Samsung Store offers some of the best deals on many of the flagships the South Korean company launched in the last few years. Usually, the Galaxy S9 and S9+ flagships sell for $720 and $840, respectively, but Samsung has both of them on sale for just $520 and $640, so customers purchasing either of the two will save $200. Keep in mind that while deal doesn't require a trade-in, only the Verizon models are eligible for the offer. On the flip side, you'll be able to choose from three color options: Black, Lilac Purple, and Coral Blue. Obviously, these deals require activation, but you will end up paying $21.67 per month for 24 months for the Samsung Galaxy S9, or $26.67 per month for 24 months for the Galaxy S9+. 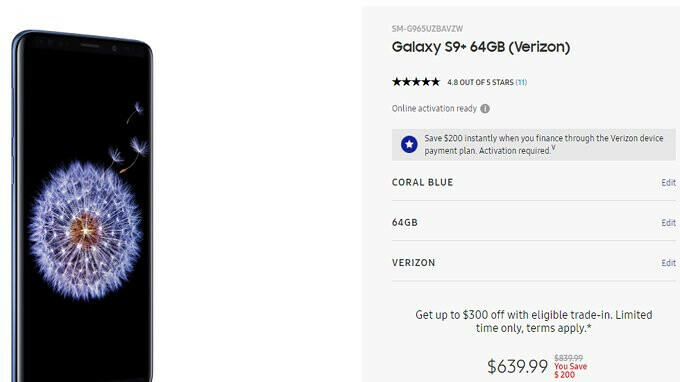 On top of that, if you have a smartphone eligible for trade-in, you can reduce the cost of the flagships even more, but you'll still have to activate them on Verizon to benefit from the $200 discount. No unlocked model, no deal. International buyer here.